There wasn't another person in the world like Jim. He never once even thought of the large sum of money that would have been his if Juliana hadn't shown up. Trixie was sure of this. Money didn't seem to mean a thing to him. He'd even forgotten the half million dollars his great-uncle had left him. Well, maybe he hadn't forgotten it, but certainly he never thought of using it for anything except the school for runaway boys he planned for the future, when he had finished college. Trixie thought of the frightened runaway Jim himself had been when she and Honey first found him hiding in the old abandoned mansion that had belonged to his great-uncle. He was hiding from that Jones man, his stepfather. It was terrible that anyone could have been as mean as his stepfather had been to Jim - especially Jim. He was just the greatest. So engrossed was Trixie in the memory of the unhappy time that she bumped her bike into the veranda step at Manor House and almost fell. Honey, waiting in her Volunteen uniform, ran to help her. "Did you hurt yourself?" she asked. :Weren't you watching where you were going?" "Huh-uh." Trixie shook her head. "I was thinking of so many things. My mind was miles away. Don't you wish that the Bob-Whites could just go on and on as we are now, just the same age as we are now?" The ghost writer of this book is thought to be Stack. 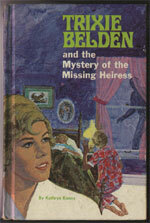 There are a number of characters in her first book, The Mysterious Code, that re-appear in this book. 8. Janie Might Be Dangerous! 9. What Happens to Missing People? 12. The Warning Signs Are Gone! When the owner of the Blue Heron Marsh land is sought, Jim finds that the land is owned by his mother's sister. An investigation by the Bob-Whites reveals that his aunt is dead and Jim has a cousin, Juliana who is still alive. The Bob-Whites go to find her, but there car is vandalised and they return home to find she is already in Sleepyside and staying with Mrs Vanderpoel. Her arrival is over-shadowed by a woman (nicknamed Janie) hurt in an accident and suffering from amnesia and captures the hearts of all around her. 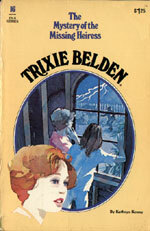 Trixie tries to help her find her family and discover who she is, but her attempts are thwarted by Juliana who tries to stop her from remembering. When another attempt is made on Janie's life and Juliana begins acting mysteriously, it is up to Trixie and the Bob-Whites to find out the truth and uncover the true identity of Janie and Juliana. Jonesy, Jim's step-father, who wants the money from his sister-in-law's land. Jonesy's niece, the fake "Juliana", who fools everyone into thinking she is Jim's cousin. Bull Thompson, an accomplice and an old foe of Trixie's from The Mysterious Code. Brian says that he thought Jim and Honey would be looking out the window, "rackets in hand, waiting for us" (p. 13). Were they intending on playing tennis? All thoughts of this disappeared as they found out about the car Mr Wheeler had given the Bob-Whites, and then Regan told them to take the horses out for a ride. The Bob-Whites were happy to accept the gift of a car, which goes against a main rule of their club. However, no one brought this up. In The Mysterious Code, Trixie made a big deal about accepting a lamp from Di's father. Mart tells Dan: "Jim and Brian will give you a driving lesson right away" (p. 24). Therefore, Dan must be older than Mart. Jim's mother's maiden name was Katje Vanderhaiden and his aunt's maiden name was Betje Vanderhaiden. It is never explained how Betje came to own that land and how Mrs Vanderpoel knew of Jim's mother and had a picture of his aunt and her family. Jim knew he had an aunt Betje Vanderheiden, but did not know she had married. If his married aunt had died fifteen years ago, Jim would have been one or two and his mother would surely have known if Mrs Vanderpoel did. This doesn't quite make sense. Trixie worked at the hospital as part of the Volunteen program with Honey. Dan's horse Spartan can dance and the previous owner had told Mr Wheeler that Spartan used to be a circus horse (p. 54). Spartan is 25 years old and "Mr Wheeler bought (Spartan) for Dan to use for light work in helping Mr Maypenny" (p. 61). However, in The Black Jacket Mystery, Regan says that "maybe we can spare old Spartan for Dan to use". Spider and Tad had moved to White Plains, where Spider had taken a better job. Janie's accident occurred outside Ten Acres on Glen Road. The Bob-Whites were in the Bronx trying to find Juliana, but surely the Belden's would have heard the accident and the emergency vehicles? It is not mentioned who found Janie. An extra room and bathroom had been built downstairs at Crabapple Farm for Trixie's father and mother just after they married. A few years later, both grandparents died (p. 104). Mart can play the guitar and pick out a tune on the melodian, while Trixie is grateful for "Brian's scout training" (p. 171). Trixie tells Hans that Jonesy "hadn't been seen around here for two years" (p. 230). Had two years passed since Trixie and Honey had found Jim? The fake Juliana was Jonesy's niece. Did Jim not know that his step-father had a niece or any siblings?